The LumaSense solution provides advanced and reliable temperature monitoring up to 330 °C. The new m924 Semiconductor OEM module sampling rate is five times faster than most other modules or converters, and provides +/- 0.1C high accuracy measurements with a wide range of industry specific communication capabilities. These combined features provide users with better and more accurate temperature measurements to improve process control. The new product provides temperature monitoring for smaller linewidth devices at higher and wider temperature ranges with significantly faster sampling rates needed in semiconductor wafer process measurements. The m920 Series Semiconductor OEM system is based on the LumaSense Luxtron brand of Fluoroptic probes and fiber optic extensions. This unique and long-standing Fluoroptic sensing technology lends itself well to variation in probe construction and is easily customized for OEMs. 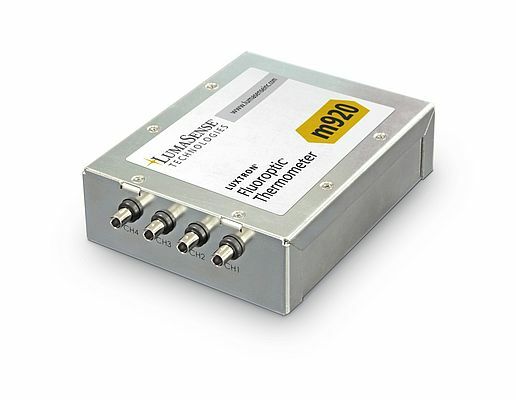 The LumaSense solution consists of the m920 Series Semiconductor OEM modules, contact and non-contact fiber optic probes, and cable extensions. The solution also offers tremendous flexibility with the mix and match probe design, minimizing costs and error of matching probes to modules and channels. The new OEM modules are backwards compatible for Luxtron m822 or m602/604 units, probes, and cables, allowing for a seamless upgrade.